Dying for Chocolate: BLUEBERRY CHOCOLATE CHIP MUFFINS: National Blueberry Muffin Day! BLUEBERRY CHOCOLATE CHIP MUFFINS: National Blueberry Muffin Day! Today is Blueberry Muffin Day, and this month is Blueberry Month, so celebrate! I'm a major blueberry person from way back, even before I knew they were healthy with antioxidants and flavonoids and vitamins. I grew up back East, and when we went to the 'country,' my Aunt Annie used to take us blueberry hunting in the woods. It was great fun. We'd all come back with blue-stained hands and mouths. Those blueberries were small and juicy and sweet as wild blueberries should be. I still crave blueberries. Local blueberries are at the farmers' market right now, and for frozen blueberries, I usually freeze my own, but in a pinch the wild blueberries from Maine at Trader Joe's are very tasty. For National Blueberry Muffin Day, use fresh blueberries in these muffin recipes. I am partial to plain muffins with blueberries and chocolate chips, so the first recipe is the one I use. But since this is a chocolate blog, I found a recipe for chocolate blueberry muffins, too. I haven't made that one, so let me know what you think if you do. Here's my recipe for Blueberry Chocolate Chip Muffins. I like my muffins firm with a crusty top and soft inside--and not too sweet. I think you'll like these. I use a 1/2 cup of sugar, but if you want them a little sweeter use 3/4 cup. Don't want your blueberries to sink to the bottom? Dust them with flour before putting them in the batter. Preheat oven to 400. Grease your muffin tin or use liners. Combine flour, sugar, salt, and baking powder. Make a well in the center. Put oil into a 1 cup measuring cup; add the egg (already whipped), and enough milk to fill cup to brim. Pour into the well and mix with flour mixture. Do not overmix. Stir in blueberries and as many of the chocolate chips as you'd like. 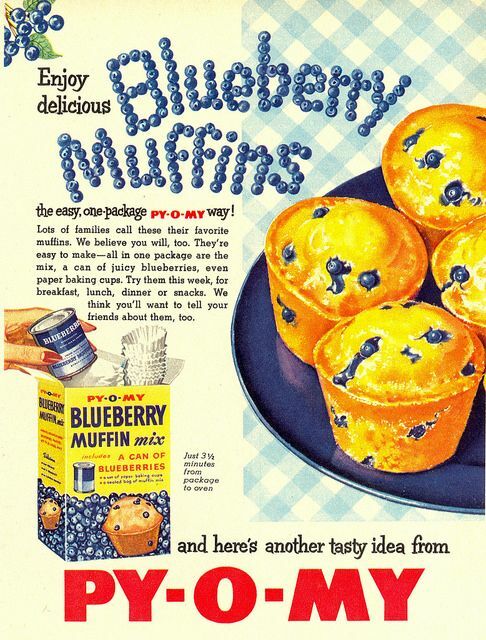 I like a lot, but you want to also be able to taste the blueberries--and the muffin, itself. Fill muffin cups right to top. Bake for 20-25 minutes in preheated oven-- or until done. So that's my favorite, but for those who want a chocolate muffin with blueberries, here's a recipe from Yankee Magazine. As I mentioned, I haven't tried this yet, but it looks easy and good. Preheat oven to 375 degrees F. In medium saucepan, melt butter and unsweetened chocolate over medium heat until smooth. Remove from heat and cool slightly. Stir in sugar, egg, buttermilk, and vanilla. In small bowl, combine flour and baking soda. Gently combine with liquid ingredients. Fold in blueberries. Spoon batter into well-greased muffin cups, filling to top. Bake 25 to 30 minutes, or until toothpick inserted in center comes out clean. Transfer muffins to wire rack to cool. Drizzle cooled muffins with semisweet chocolate. Have a great Blueberry Muffin Day--make it Chocolate! 1-2-3 HOT FUDGE SAUCE: Hot Fudge Sundae Day! PINA COLADA FUDGE: National Pina Colada Day! CHOCOLATE-BERRY MERINGUE: Fourth of July!